Business data that is passed in business operation consists of several [Data Items]. For example, in the case of "Leave Application flow", it consists of [Data Items] such as 1)Absence Start date, 2)Absence End date, 3)Reason for Leave, 4)Superior's Comment, etc.. Not only common Data types such as [String type] and [Numeric type], but also [File type] and [Discussion type] are available to be defined. For example, Add a [Date type] data item for "Leave Start Date", and a [String type] data item for "Comments". Up to 300 [Data items] can be added to an individual [App]. A [Data Definition number] will be given automatically upon adding the item. 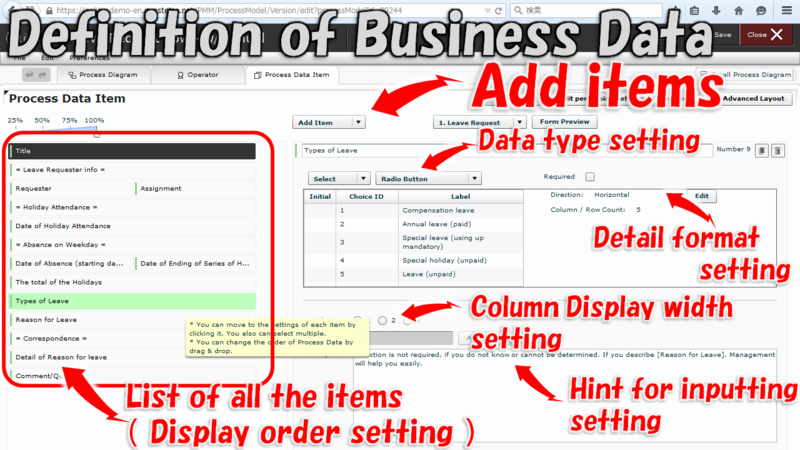 You can modify the layout of the displaying order of the data items using Drag ＆ Drop (the display width is determined in the Column setting). The [Data Definition number] remains the same, even when the layout has changed. After releasing the [App], you will not be able to modify the [Data type]. String in [Field Name] must begin with "q_"
You can configure it in the property screen of the [Workflow Diagram] also. It doesn’t matter even when a particular data item is set as hidden at all the steps (for example, Input items that are no longer used). [Title] is a "Special fundamental data item" which cannot be [Hidden] at any Step. You can delete freely by clicking on the [Remove] button. By clicking the [Remove] button, the data item will be out of the search scope and will not be included for bulk download. Even for the elements that are no longer to be input after revision, for those that will be frequently referred to, you should set them as [Hidden] during the entire process. Is a data type in which you can input basic data, such as, strings and numbers in a table format (Not available for smartphones). Is a data type that can store multiple files (Image files will be previewed). 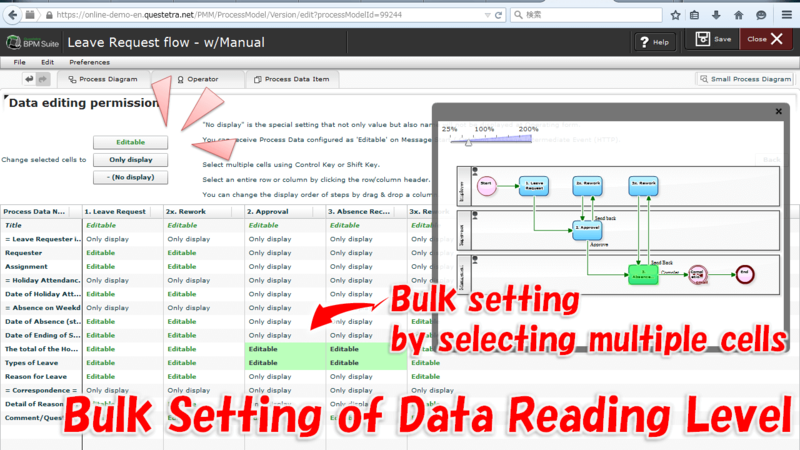 Helps select a [User] out of the information managed in the whole Workflow platform. Helps select an [Organization] out of the information managed in the whole Workflow platform. Z3. More Info: Cases of Data Reference at Automated Step,etc. Z4. 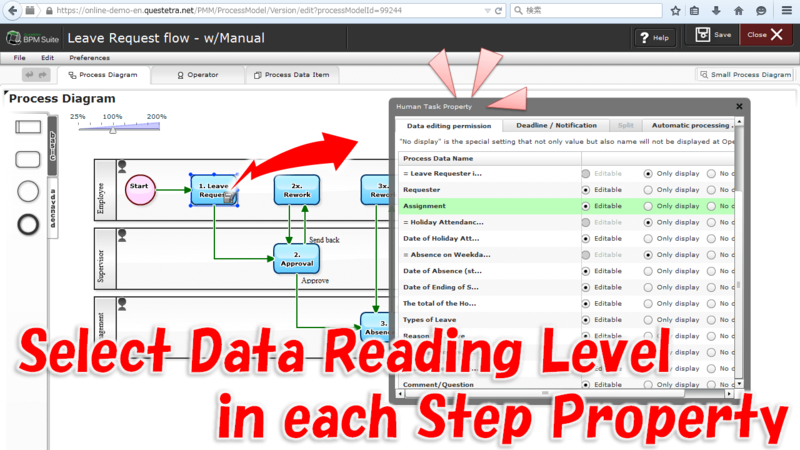 More Info: Cases of Data Assignment at Automated Step,etc. Upon receiving Numeric type data in [Message Start Event (HTTP)] or [Catching Messages Intermediate Event], unintended numeric conversion and errors may occur if the value of receiving Numeric type data doesn't meet the settings of the Numeric type data item (Symbol for Decimal mark, the number of digits after decimal point). 2015-05-11: Not Directly Modify Expense Paid Data! 2015-01-13: Let's Standardize 'Proposal Creation Process'! 2014-05-26: Timed Updating of System Common "Choice XML"
2014-04-07: The Significance of [The REVOLUTION] which is "Digitization to Minutes Board of Directors Meetings"